It requires making new, healthier choices for yourself. You’ll learn to refrain from eating fast foods, processed convenience foods, and sugar-laden snacks, which place an unnecessary load on your body. Instead you’ll learn to turn to whole, unprocessed, preservative – free foods, lots of pure spring water, tasty shakes, and whole food supplements. In the process, you will learn about your body and what it needs to stay healthy. You’re also likely to shed some extra weight. 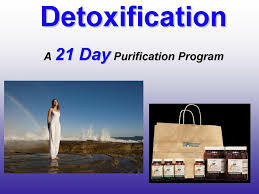 Call our office to see how you can participate in a detox program.